A leading group of Republican senators is petitioning the Trump administration to reopen the Guantanamo Bay prison camp to hundreds of foreign ISIS fighters captured on the battlefield, according to a copy of a letter sent Tuesday to the White House and obtained by the Washington Free Beacon. As the Trump administration continues to take the fight to ISIS forces in Syria and elsewhere, Sens. Tom Cotton (R., Ark,), Ted Cruz (R., Texas), Marco Rubio (R., Fla.), and John Cornyn (R., Texas.) are petitioning the administration to use the prison camp established on the U.S. naval base in Guantanamo Bay, Cuba, as a holding facility. The timing of the letter coincides with the 10-year anniversary of the Obama administration's executive order to close Guantanamo Bay. President Donald Trump reversed this order and the prison remained open, but no new prisoners have been transferred to the facilities during his time in office. With nearly 700 "battle-hardened terrorists in northeast Syria" currently being held by U.S. coalition partners with the Syrian Democratic Forces, the senators fear these captives could escape or be released from custody so they can again take up arms against U.S. forces and allies. "We urge you to consider transferring the worst of these Islamic State fighters to the detention facility in Guantanamo Bay, where they will face justice," the senators write to President Donald Trump on Tuesday, according to a copy of that letter obtained by the Free Beacon. "Thank you for your continued leadership in our military campaign against the Islamic State and your willingness to consider this matter of national security." 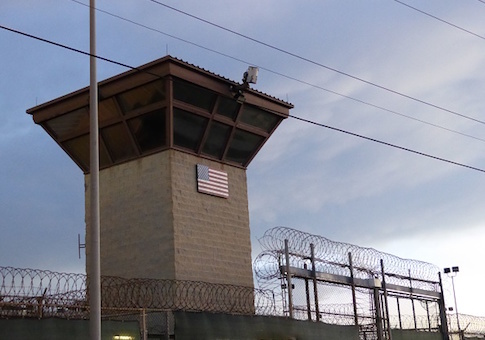 All told, 775 inmates have passed through Gitmo's notorious prison walls, with just 40 detainees still being held at the facility for alleged crimes related to the 9/11 attacks and other terrorist plots. It is unclear if the joint military task force that currently operates the prison located on a sequestered side of the naval base has the capacity to take in and care for a massive influx of new detainees. "As U.S. and partner forces have waged a campaign against the Islamic State over the past four years, we have captured hundreds of foreign enemy combatants," the senators write. "Our partners, the Syrian Democratic Forces (SDF), are currently detaining over 700 of these battle-hardened terrorists in northeast Syria." "These detainees," they continue, "include two of the so-called ‘Beatles,' expatriated British citizens suspected of joining ISIS and beheading Western hostages. Given the rapidly shifting dynamics in Syria, it is possible that these terrorists may escape or be released from SDF custody in the coming weeks and months." Gitmo, the senators argue, is the best place to house these high-level detainees who also might have operational intelligence about ISIS and its plans. "It is imperative that these Islamic State fighters not be released. If given the opportunity, many of them will take up arms against our Syrian and Iraqi partners or attempt to infiltrate the United States and Europe to carry out terror attacks against civilian targets, like they have already done in France and Belgium," the senators write. One senior congressional aide familiar with the call said the U.S. withdrawal from Syria could complicate efforts to ensure these militants remain imprisoned. Sending them to Guantanamo could ensure they remain off of the battlefield. "One of the unfortunate consequences of withdrawing from Syria is the probable return to the battlefield of some seriously bad Islamic State fighters—think terrorists with weapons training and combat experience," said the source, who would only speak on background about the matter. "It would be a terrible and completely avoidable mistake to allow the worst of these assholes to go free to carry out terror attacks in the Middle East, Europe, or the U.S. We have plenty of empty cells at Gitmo, and we might as well fill them up with these terrorists who are too dangerous to set free." This entry was posted in National Security and tagged Guantanamo, ISIS, Tom Cotton. Bookmark the permalink.